Workshop: Tub Truffles! Moisturizing bath bombs! *$10 to sign up to cover materials. Pay what feels right for my labour and the store's costs after the workshop. Puzzled about what to pay? Read my blurb about it below and still want me to tell you what to pay? New feature - pay $50 with your registration and you are done! 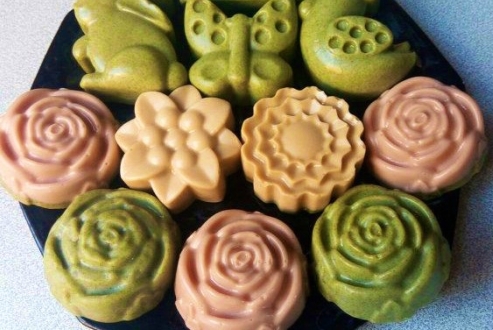 Create fizzing moisturizing delights using cocoa butter, natural soda, citric acid with clays and micas of every colour, and dozens of exquisite essential oils. Come home with one dozen custom coloured and scented tub truffles in up to 4 labelled gift bags. Trade varieties with your fellow participants! What a wonderful class this was. You, Tracey are just fantastic. I was entranced listening to you and appreciated the fact that you took time to answer questions and explain the whys and wherefores as we continued. Thank you. I have always been interested in potions, creams, lotions, I loved the course today. I can hardly wait to learn more, and am looking forward to more classes with you. Once again, thank you. TO KEEP YOUR SPOT: I ask you to pay at least $10 to hold your spot. You may pay more if you are able to and it feels right. AT THE END OF THE WORKSHOP I WILL ASK YOU TO PAY WHAT FEELS RIGHT FOR OUR LABOUR. GROUP RATES: *$20 minimum commitment per participant is the group rate. When you register 3 or more participants, I will adjust your rate to $20 each. If you or your participants can afford more, please bring an honorarium to the workshop. HST 13% is applied when you check out. Donations given at the end of the workshop will not be taxed, but I can give you a receipt if your contribution is not anonymous.